BJ Jones, DVM – Center Hill Veterinary Clinic, John Weinkes- Vita Plus, Scott Heinberg – Genex, and Sara, Andy, and Brian Schilling of Schilling Farms, LLC are pictured in Sacramento, California. 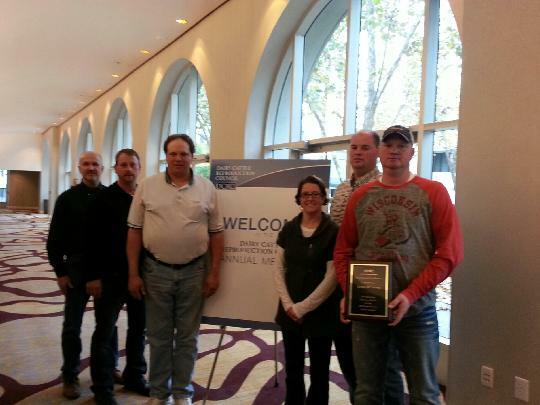 Schilling Farm’s were singled out for Platinum Honors, the highest award presented by the Dairy Cattle Reproduction Council. Congratulations! Byron and Diana Boysen were gracious to share their knowledge and talented miniature donkeys with the Lafayette County 4-H Horse project during this sunny August day. 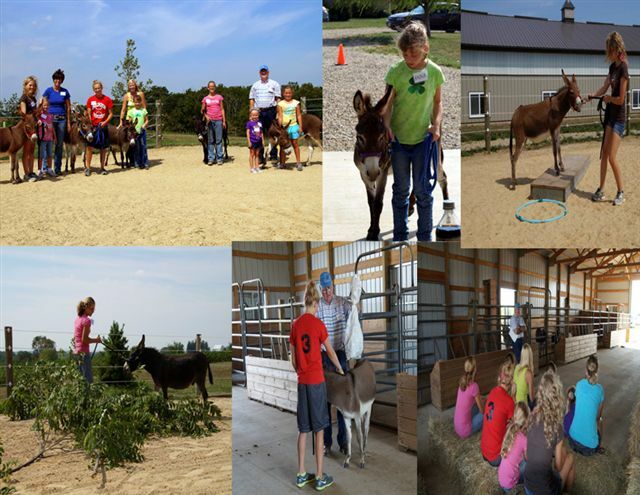 4-Hers were able to gain knowledge about care and training using a “hands on” approach at this clinic hosted by Dr. Boysen and his wife Diana at their beautiful farm in Argyle, Wisconsin. Thank you also to volunteer Barb Smith, horse project leader Leigh Lierman, and the parents who assisted with this event. Congratulations to Allyson Whitcomb and her home bred steer, Quzu, who was crowned Grand Champion Steer at the Lafayette County Fair July 14th, 2012. Hard work, good genetics, and a quality feeding program resulted in a successful year at the fair for this young and ambitious lady. 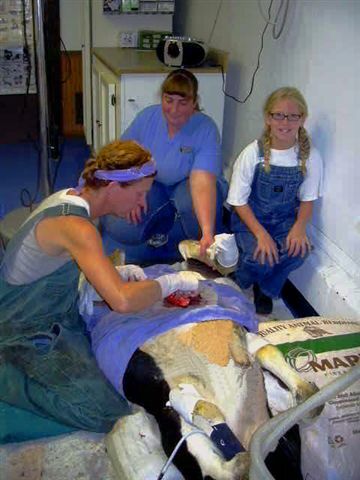 Surgeon Meegan Ritchie, DVM, anesthetist Michelle Reuter, CVT and visiting student Holly work together to repair an umbilical hernia in this young Holstein heifer. 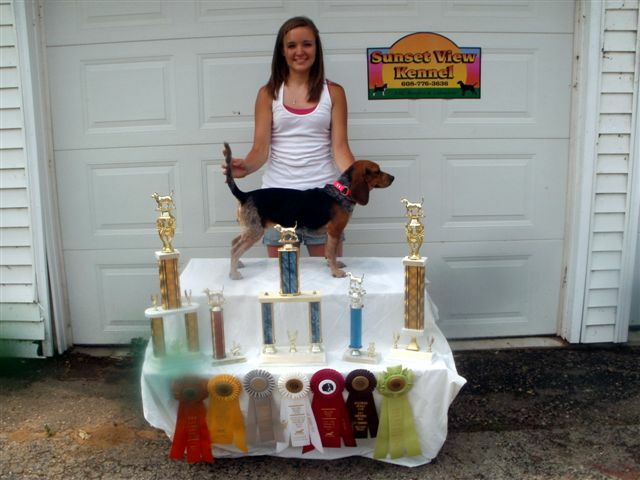 Alyssa Kilcoyne, shown here with Sunset View Lolly Pop, won the 2012 Wisconsin 13th All-Age Champion. Her hard work also paid off with Sunset View Tootsie Roll, the 2012 Wisconsin 13th Derby Champion. Alyssa breeds, raises, and trains her own dogs. She makes Lafayette County proud! 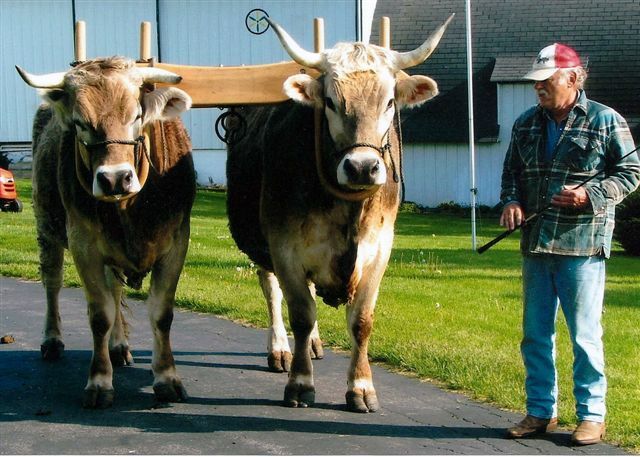 While Terri is busy breeding and raising Boer goats, Tom enjoys his team of Brown Swiss oxen and raising Pinzgauer cattle on their farm north of Argyle, Wisconsin. Tom refers to his steers as “Off Ox” and “Nigh Ox” based on their position in the yoke. 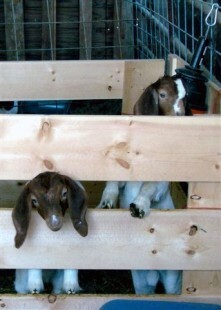 Thanks to a successful cesarian section and the hard work of owner Terri Wolfe, these two thrifty kids are vigorous and enjoying life. 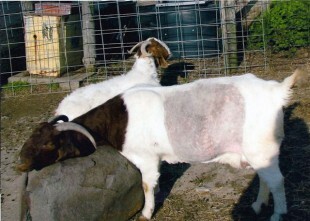 Boer goats were developed in South Africa in the early 1900’s for meat production. Dairy farmer, Steve Rear, enjoyed a day in the outdoors while bird hunting at Tanglewood Ranch with his son-in-law, Lucas Ritchie and Lucas’s brothers, Weston and Wade. 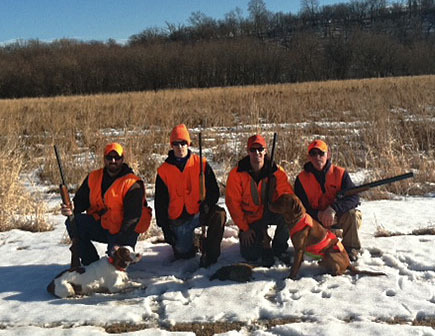 Brittany Spaniel, Porter, and Brittany-Lab cross, Leinie, would be quick to agree that a day spent in the Wisconsin outdoors is never a day wasted. Wade Larson, Darlington, raises purebred Berkshires and attends school at the University of Wisconsin – Platteville. He hopes to someday own and operate a show pig business. 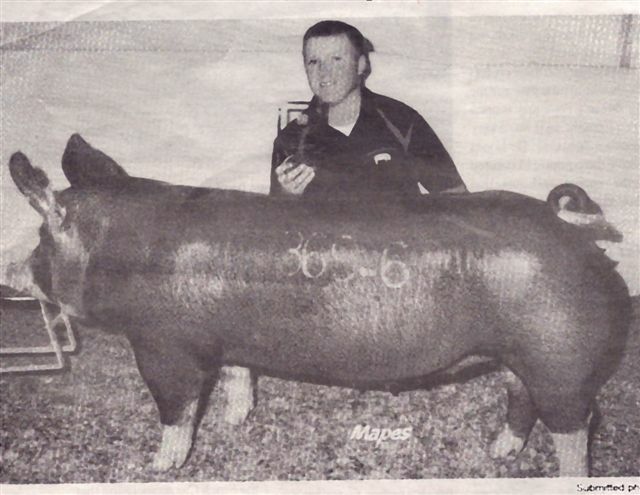 A Reserve Championship at the National Barrow Show in Austin, Minnesota means he’s off to a great start! The charismatic Thoroughbred stallion, Southland Jazz, owned by Dan and Jari Sullivan, brought home a successful 6 1/2 furlong win at Hawthorne Racetrack in Chicago. 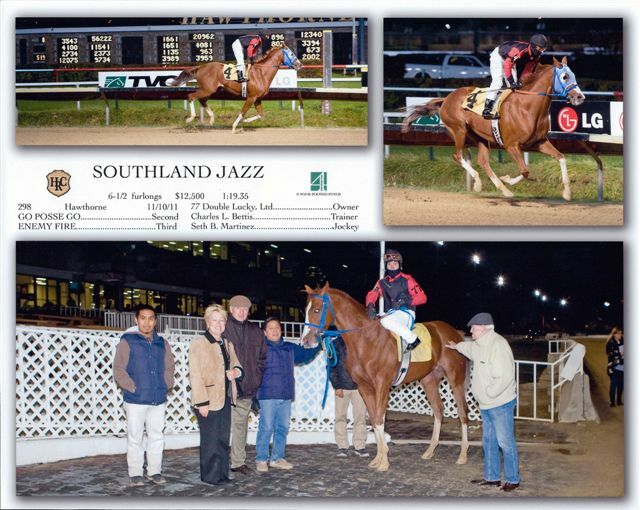 Southland Jazz was bred and foaled on Dan and Jari’s farm in Elizabeth, Illinois. He is sired by their stallion, Southland Blues. Michelle and Joe Mattingley from Scales Mound, Illinois raise, compete, and sell endurance horses with an International scope. Their horses Dangerzone and Holliwood are seen below competing in an FEI endurance race in the United Arab Emirates. 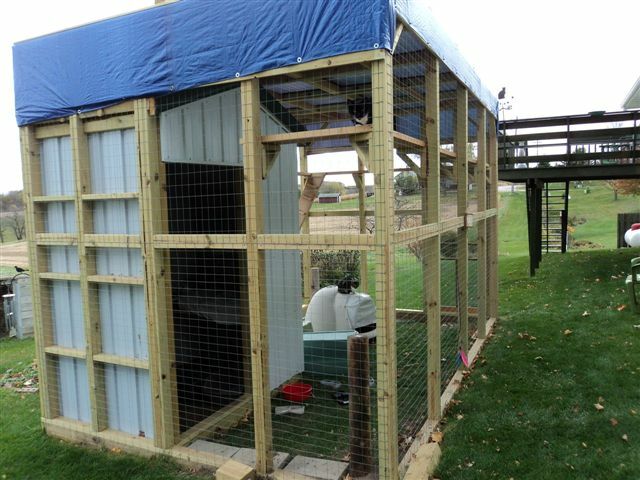 Sue recently finished construction of her outdoor cat condo for her four cats, complete with scratching posts, beds, and cat walks! 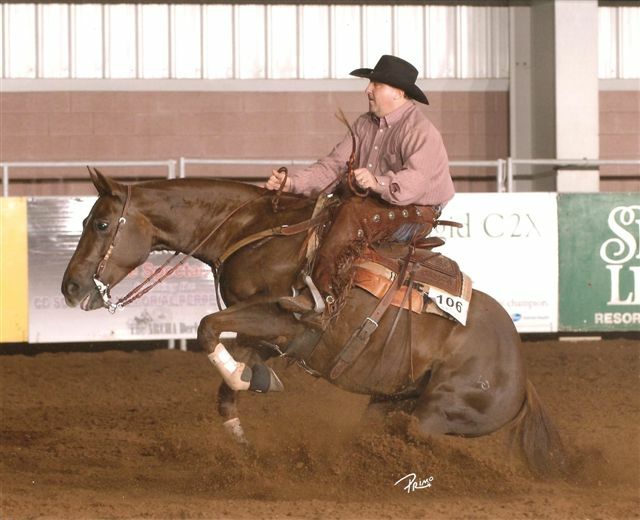 Congratulations Kenny Schueller and Blondies Peppy Grace, AQHA World Show qualifiers! Good luck in the AQHA Working Cowhorse competition, November 5-19th, in Oklahoma City, Oklahoma. Peggy Sheffer is making a difference! 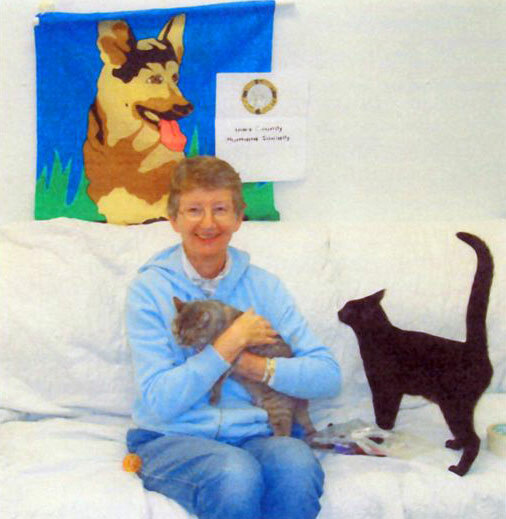 The founder of Everyone Needs A Home has been an enthusiatic advocate for the spaying and neutering of cats and dogs in Lafayette and Green Counties. 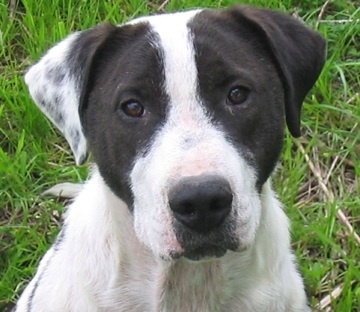 Over 1,000 animals have been spayed or neutered for area residents through area donations and grants to her organization. Learn about Spike’s story and find out more information by visiting EveryoneNeedsAHome.org.